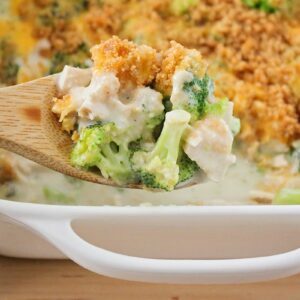 This Chicken Divan recipe is loaded with chunks of tender chicken and broccoli, smothered in a rich and creamy sauce, and topped with crisp, buttery bread crumbs. Preheat the oven to 375, and spray a 9 x 13 baking dish with cooking spray. In a large skillet, heat the butter over medium heat, until melted. Add the flour and whisk to combine. Cook 2-3 minutes, or until bubbly and golden. Slowly whisk in the chicken broth, followed by the milk, stirring constantly to prevent lumps. Cook the sauce until thickened and bubbling. Remove the sauce from the heat, and stir in the sour cream and salt. Add the broccoli to a microwave safe bowl with 2 tablespoons of water. Cover and microwave on high for 2 minutes, or until softened slightly but not fully cooked. Drain well. Add the broccoli and chicken to the skillet with the sauce, and stir to combine. Pour into the prepared baking dish, and sprinkle with the cheddar cheese. In a small bowl, mix together the melted butter and bread crumbs. Sprinkle the bread crumbs over the top of the chicken mixture. Bake 20-25 minutes, or until the bread crumbs are golden brown and crispy, and the sauce is bubbling. Serve hot with cooked rice, noodles, or mashed potatoes.